NEW YORK [CONSENSUS 2018], May 14, 2018 — Tech Bureau, a blockchain software and services provider, today announced the highly anticipated public release of mijin v.2, also known as Catapult, a full-featured, blockchain engine delivering a new version of the NEM protocol for both public and private networks for enterprise. The company is also launching a self-service, on-demand developer lab that will enable companies and individuals to get started on Catapult quickly without having to manage their own infrastructure. The Catapult platform represents a commercial open source approach to an enterprise distributed ledger offering built by Tech Bureau, powering both public blockchain networks, like NEM, as well as larger-scale, high-throughput enterprise distributed ledger deployments, complete with unique smart contract plugins. These plugins enable bulletproof digital asset creation, decentralized swaps, advanced account systems and business logic modeling. 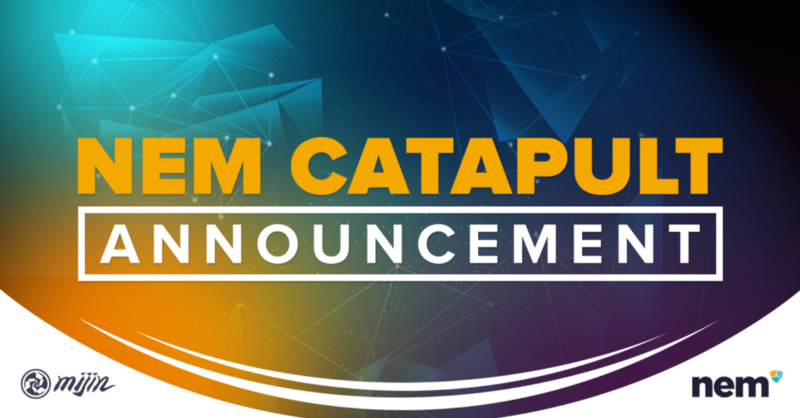 The release of Catapult comes after nearly three years of development, testing and other work on the platform, an enterprise-ready version of the NEM protocol for running both permissioned and mixed private/public blockchain networks. Catapult has introduced aggregated transactions and multi-level, multi-signature accounts, features not available on any other blockchain. These features will accelerate enterprise blockchain adoption with the ease of use and implementation capabilities to serve the needs of the biggest technology businesses in the world, whether for electronic money systems, user authentication, land and property registration, logistics tracking, food traceability, or other uses. Earlier this spring, Tech Bureau released the developer preview of Catapult. A production-ready enterprise version, along with open source and commercial licensing, are planned for the second half of 2018.